In 1986, singer Christa Päffgen, a.k.a. 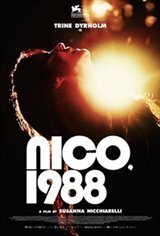 Nico, scours the underground halls of Europe to promote her latest album. From England to Poland, via Italy and Czechoslovakia, the journey resembles an improvised vacation rather than the international tour of a singing star. Richard, the organizer, tries to keep the group together by managing the logistical hassle, as well as the rants and demands of Nico, with whom he is secretly in love. But on the eve of her 50th birthday, Nico, who was once the face of the New York scene, is a disillusioned woman, haunted by memories of a painful past.